As we get older, we may have issues with mobility that require us to use a walker or wheelchair to get around. Mobility concerns extend to the bathroom within your home. It is important to make changes and develop an accessible bathroom layout that best addresses your mobility issues and concerns. Install a handicap shower stall with a seat. This type of shower has a zero-entry barrier so you can easily walk into or roll your wheelchair into the shower. There are grab bars and a seat to make showering easier and reduce your risk of slipping and falling. Install grab bars in your existing tub/shower. 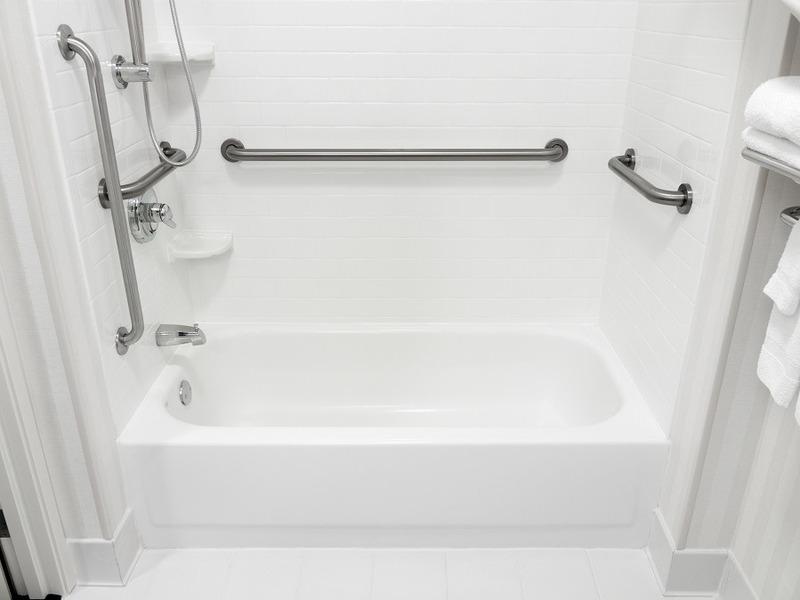 If getting into and out of the tub is not an issue, you should still have grab bars installed as a safety precaution. Replace the door with a sliding door. If the doorway to the bathroom is tight, you can remove the door and install an overhead sliding door. Plus, sliding doors are also easier to operate if you suffer from arthritis. Install a wall-mounted toilet that is elevated. You can have your plumber move your toilet so it is mounted on the wall. Raising it higher off the ground makes it easier to get on and off the toilet. Install safety rails around the toilet. You will want to have safety grab bars placed near the toilet to aid in sitting down and getting up from the toilet. Lower wall cabinets for easier access. Bathroom wall cabinets are typically mounted much higher up and can make reaching items difficult. Have your contractor lower the cabinets. You may also want to remove the doors on some of them so they do not get in your way. Remove cabinets from under the sink. If you are wheelchair-bound, you need space under the sink for the wheelchair. Taking out the cabinets can provide the necessary space. Lower the sink to a comfortable level. 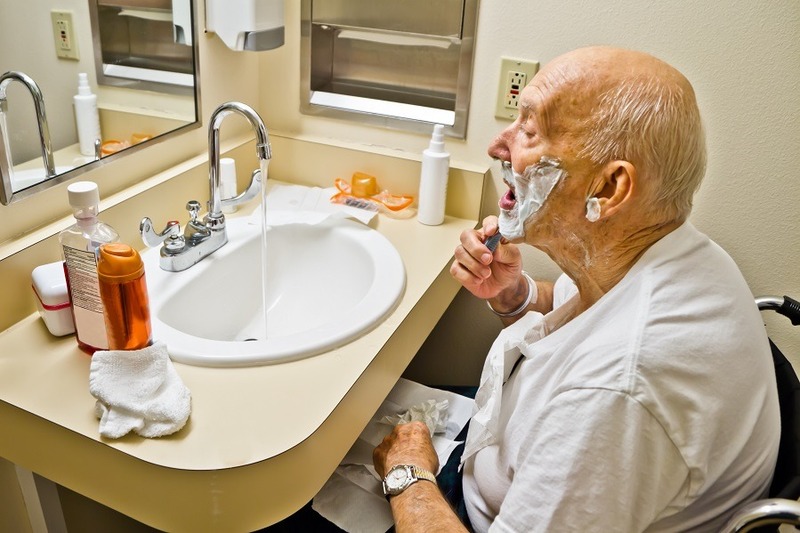 If you are in a wheelchair or need to sit down while brushing your teeth or shaving, have the sink lowered to a level where it easy for you to reach the faucet and use the sink. Remove slip hazards from the floor. Take out rugs and bathroom mats that could create a problem moving over them with a wheelchair or walker. Install slip-resistant flooring. It can be helpful to get different flooring that will not get slippery if water or moisture gets on it. Have light switches and electrical outlets You will want to make sure you can easily reach light switches and any electrical outlets in your bathroom. Talk to your electrician about having them placed in a location that best reflects your needs. Add more lighting. You could have a window installed to bring in more natural sunlight or new light fixtures to help brighten up the bathroom for more even lighting. For barrier-free accessible ADA-compliant shower systems and other accessories to make your bathroom handicap-accessible-friendly, please feel free to contact American Bath Enterprises, Inc. at (888) 228-4925 today!